I’m usually not one for pretty breads. I like my breads rustic and charred. But during the holidays it can be nice to change that up a bit and make a beautiful loaf of something. 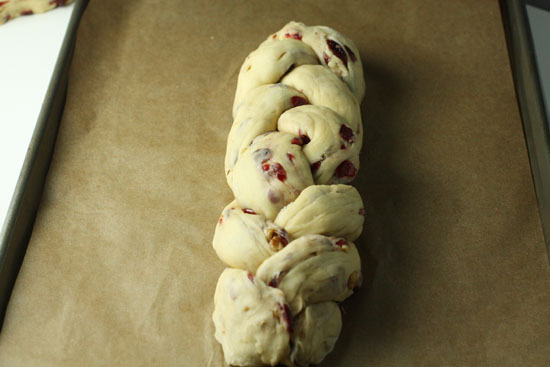 This braided bread is laced with walnuts and cranberries and tastes and pairs very nicely with other turkey day fare. 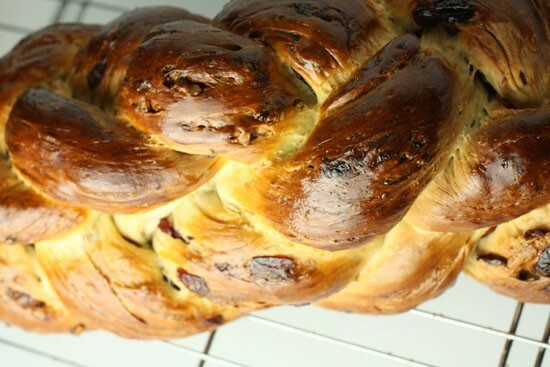 If the braiding thing scares you, you can bake this normally as a boule I guess. I think the braiding and stacking does add a certain wow factor to the final celebration bread loaf though. There’s a lot of flavor in this bread. 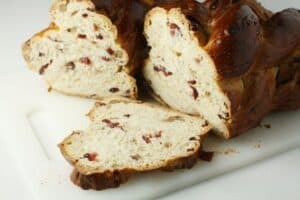 It’s kind of sweet and heavy much like a brioche loaf, and it’s studded with cranberries and walnuts which gives it a very Thanksgiving feel to it. 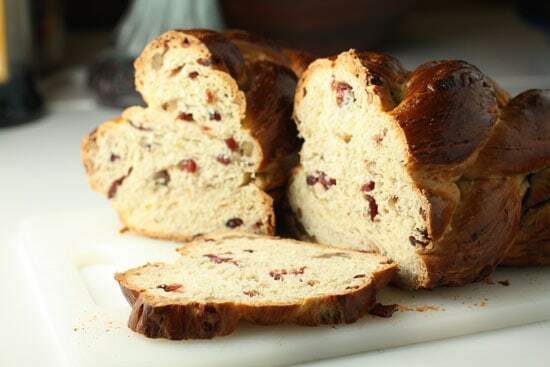 An enriched bread that’s sweet and dense and perfect for the holidays. I used dried cranberries and walnuts for this version. 1) Stir together dry ingredients so they are mixed well. Add wet ingredients and 1/3 cup of water. 2) Turn ball of dough onto a floured surface and start kneading it. The dough should be soft and pliable, but not sticky at all. If it’s too stiff, just need in spoonfuls of water until it softens up a bit. If the dough is too soft, you can knead in some flour. 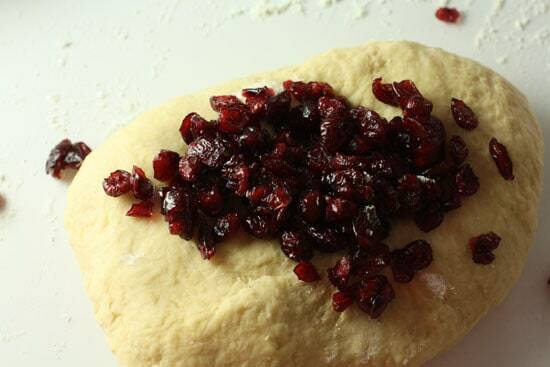 3) Knead in cranberries and walnuts. 4) Add dough to a lightly oiled bowl (turn the dough ball around so the entire thing is lightly covered in oil) and let it rise at room temperature for about 2 hours or until it at least doubles in size in a bowl loosely covered with plastic wrap. 5) Divide the dough into six pieces. You need three larger pieces that should be 9-10 ounces in weight and then three smaller pieces that are closer to 4 ounces in weight. 6) Take three large strands and roll them out to be about 12 inches long and even diameter. Set all the strands out on a baking sheet with parchment paper so they are parallel to each other. Then, starting in the middle, take the strand on the far right and put it over the middle strand and under the left strand. 7) Braid the bread. Take the outside strand and wrap it over the center strand. Continue to braid the outside strand over the middle until that side is done. Pinch the three strands together so they don’t come apart in the oven. Turn loaf around and then braid the other end. 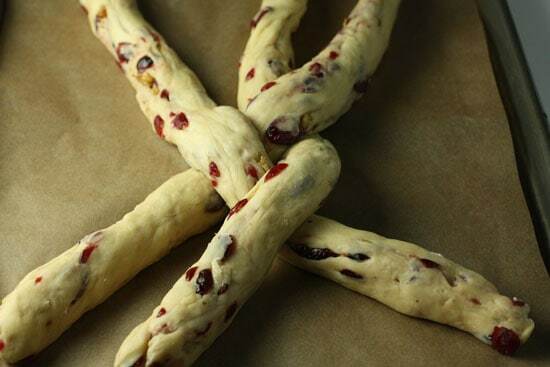 8) Make the exact same braid structure with the smaller three dough pieces. Instead of rolling them out to be 12 inches though, they should be 8-10 inches long. Braid them the exact same way though. 9) Set the smaller braided piece on top of the larger one. Brush the entire loaf with your egg wash and then let it rise a second time for about 90 minutes. 10) Preheat oven to 325 degrees. After 90 minute rise, brush the loaf a second time with egg wash.
11) Bake the bread on the same baking sheet with parchment paper for 50-60 minutes, rotating the bread halfway through so it cooks evenly. 12) Let cool for at least an hour before cutting. Recipe from The Bread Baker's Apprentice. If you bake even occasionally, you might notice that this recipe has a pretty good amount of yeast in it. Actually, it has kind of a lot of yeast in it. Looks like a lot of yeast, but necessary. Because of the high yeast content, the dough rises really nicely and has a great yeasty flavor to it. 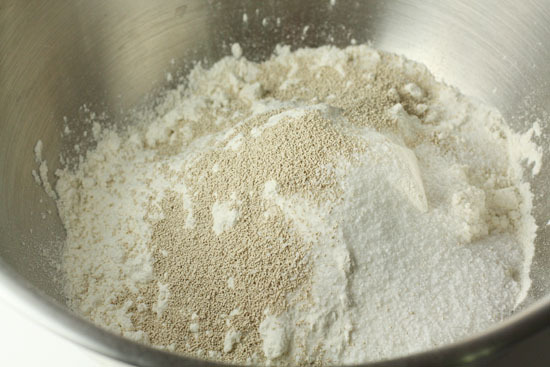 To start the dough stir together your dry ingredients so they are mixed well. Then you’ll need your wet ingredients. I used lemon extract because I had it, but I think it might be more Thankgiving-ish if you used orange extract. You could use orange extract also. Add your wet ingredients and just enough water for the dough to come together in a ball. For me, this was about 1/3 of a cup. You might need more or less though. Turn your ball of dough onto a floured surface and start kneading it. The dough should be soft and pliable, but not sticky at all. If it’s too stiff, just need in spoonfuls of water until it softens up a bit. If the dough is too soft, you can knead in some flour. Then you’ll need your extras. You could use any sort of nut or dried fruit really, but these two make the whole final loaf taste very Thanksgiving. 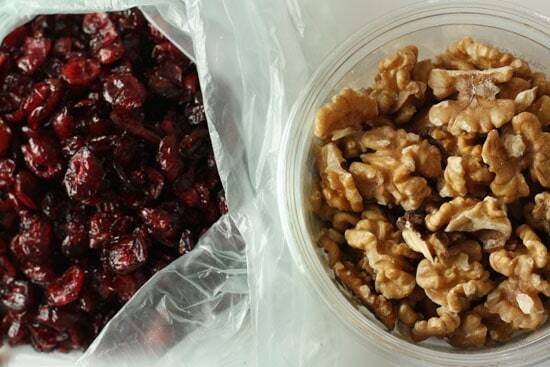 Cranberries and walnuts were made for each other. 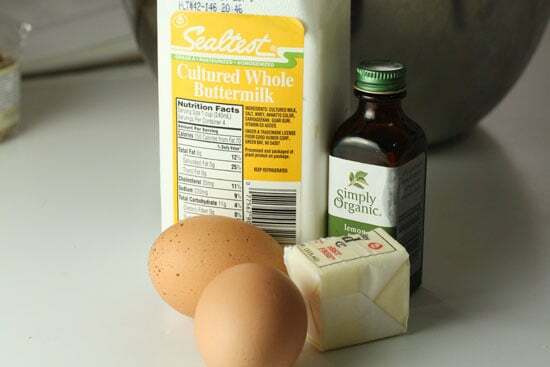 Mixing these ingredients into the dough takes some work actually. I was able to get all the cranberries and walnuts distributed equally in three batches, kneading for a minute or two between each batch. It will seem like they won’t all fit. But they will. 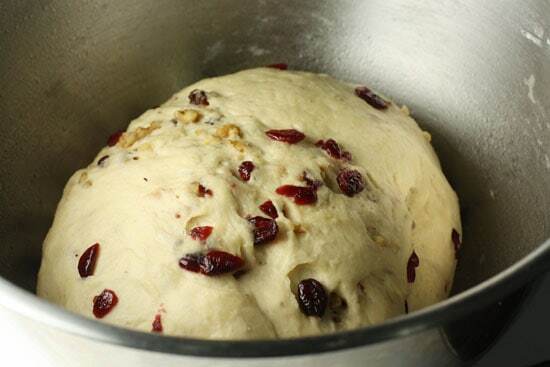 Once all your cranberries and walnuts are incorporated, add your dough to a lightly oiled bowl and let it rise at room temperature for about 2 hours or until it at least doubles in size. Be sure to turn the dough ball around in the bowl so the entire ball is lightly coated with oil. Make sure to cover the bowl loosely with plastic wrap. After two hours, you’ll have a very beautiful ball of dough. 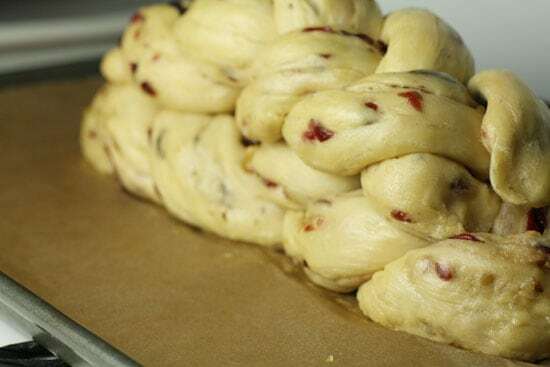 Before you make your braid, you need to divide the dough into six pieces. You need three larger pieces that should be 9-10 ounces in weight and then three smaller pieces that are closer to 4 ounces in weight. If you don’t have a kitchen scale, just try to get them close. Then you braid! Take the outside strand and wrap it over the center strand, like this! Continue to braid the outside strand over the middle until that side is done. Then pinch the three strands together so they don’t come apart in the oven. Turn your loaf around and then braid the other end. The only difference about the other end is because of the way your braid is shaped you’ll weave the outside end under the middle strand. Again, when that end is done, pinch the three strands together. You should end up with a good looking braid of bread. It might sound like a lot of work, but it isn’t actually that hard once you get the hang of it. 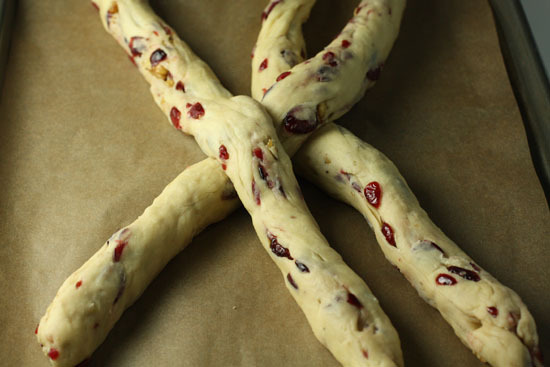 You’ll want to make the exact same braid structure with the smaller three dough pieces. Instead of rolling them out to be 12 inches though, they should be 8-10 inches long. Braid them the exact same way though. Then just set the smaller braided piece on top of the larger one. Brush the entire loaf with your egg wash and then let it rise a second time for about 90 minutes. The loaf will puff up very nicely. This thing gets pretty huge. Before the bread is done with its second rise, be sure to preheat your oven to 325 degrees. After 90 minutes, brush the loaf a second time with your egg wash. Brushing it twice will give it a really golden color and a crusty exterior. Bake the bread on the same baking sheet with parchment paper. It’ll need to bake for a total of 50-60 minutes and be sure to rotate the bread halfway through so it cooks evenly. When you pull it out, your bread should be a very deep brown and sound slightly hollow when thumped. This was hard to cut into, because of its beauty. Let this cool for at least an hour before slicing into it. I liked this bread a lot and so did Betsy. It’d be great to just have around the table during the day. As an aside, I used a photo of this bread in my 2010 Macheesmo calendar. Nicholas: as you probably know, my people developed an idiosyncratic form of bread called Challah. Is this the same thing, substituting cranberries for raisins? It’s very similar. The book where I got this recipe has a separate Challah and this. I think Challah is slightly MORE enriched (more eggs, more sugar). Your bread is so gorgeous, from the colour, crumb and rise! This bread looks so darn good. I think you need to open a bakery!!! I’m not a breadmaker (but I might turn into one with all of your yummy looking easy recipes). 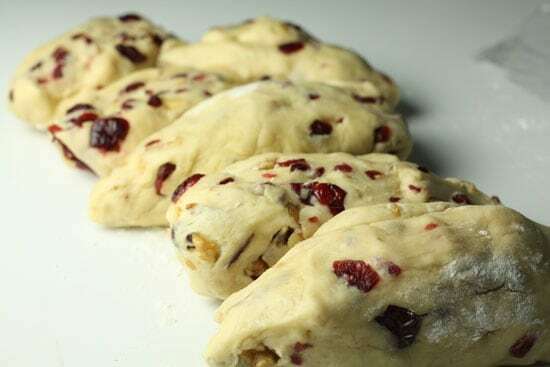 Instead of struggling with incorporating the fruit & nuts in during the kneading process, why not just mix them in with the dry ingredients in the beginning?